Swiss company Girard-Perregaux has introduced a new version of its famous model Cat’s Eye Steel, whose body is made of stainless steel. Novelty has a polished steel case in the form of an oval size 38h33 mm. Waterproof to 30 meters, is fitted up with bezel decorated with 56 diamonds weighing 1.08 carats. On both sides of the body mounted sapphire crystal with anti-reflective coating. Model Cat’s Eye Steel is available in two versions: with a white or beige dial, decorated radiant finish. Dial markings made in the form of overhead Arabic numerals, hour-markers and sprockets. Time display performed by the central arrow hour and minute. Small seconds dial is put to the side in the 9:00 position. Date indexed with a digital indicator built into the oval aperture in the 3 o’clock position. Analog-reserve indicator is set to 5:00. New functions on the manufactory automatic mechanism Girard-Perregaux GP03300, assembled by 27 stones. Provides a unique caliber carrying frequency of 28 800 vibrations per hour and 46-hour power reserve. Watch Cat’s Eye Steel staffed calfskin strap corresponding to the color of the dial – white or beige. The strap has a folding clasp in stainless steel. 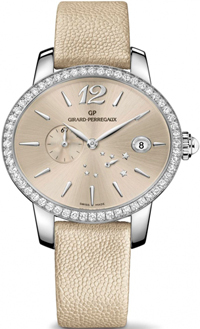 Buy watches Cat’s Eye Steel is available with the company’s representatives Girard-Perregaux.